The first time you get a good look at her, she has a blaster in her hand,” my colleague’s face lights up as she recalls the opening scene of 1977’s Star Wars. In my head, the scene rewinds. Six minutes into the opening act, a retinue of Stormtroopers spot the young princess and attempt to apprehend her. But not before she shoots one of them dead. “How is that not cool? !” my colleague says. To some extent I understand where she is coming from. This was no damsel in distress act like most female characters. This was a princess that could hold her own without the help of a man. We got into a conversation about Princess Leia a day after she would have turned 62, October 21. Carrie Fisher, who portrayed Leia, passed away on December 26, 2016. I was in the newsroom when I spotted the story from our wire service. It took me a while to process the news. I muttered “oh my goodness” again and again like a broken record. It was difficult to maintain composure that day. Princess Leia Organa is Fisher’s most iconic role. She was 19 when she was cast as the galactic royal. According to the BBC, other actresses such as Amy Irving, Cindy Williams and even Jodie Foster were considered for the role. At the time Fisher was chosen, she only had one film under her belt: Shampoo from 1975. 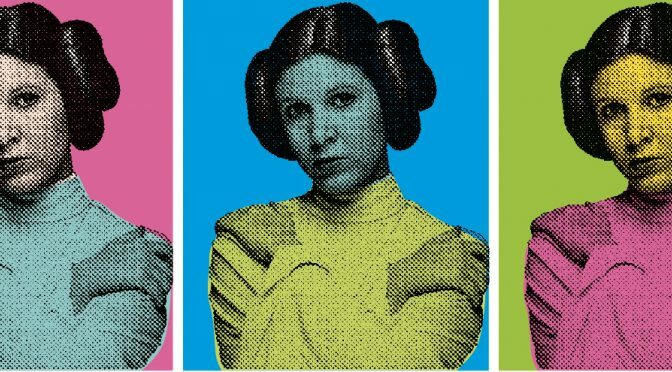 She would then go on to portray Leia in subsequent Star Wars films — The Empire Strikes Back (1980), Return of the Jedi (1983), The Force Awakens (2015), and The Last Jedi (2017). She is also slated to appear in the upcoming Star Wars: Episode IX (2019) through the use of archival footage from earlier films. But Fisher wasn’t just the lady who was in Star Wars. Her costume as Leia is as famous as the actress. Her outfits and hairdo are a staple of cosplay conventions worldwide (Dubai’s Comic Con included). In these conventions, you see women of all ages donning all-white and wearing her signature hairstyle, the ‘cinnabon bun’. Another costume of hers to have gained a cult following is the gold bikini from Return of the Jedi. Like the film series that made her iconic, Fisher’s life story is also built around the idea of hope. In a series of interviews with Stephen Fry, she spoke about being diagnosed with bipolar disorder and battling drug addiction. At an event in Australia, she revealed that her conditions came to a head when she was rushed to the hospital after overdosing on sleeping pills on the set of The Empire Strikes Back. This episode would later become the foundation of her novel Postcards from the Edge. Throughout her life, Fisher remained an outspoken activist about drug addiction and mental health.